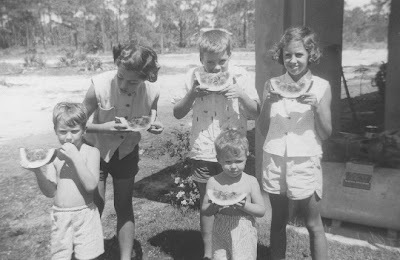 Me and my brothers and sisters eating watermelon on a hot Florida day in the Fifties. That's me on the left side of the photo, trying to get a watermelon seed out of my mouth. I was like four years old. I like watermelon, well I used to like it, but because I have a low tolerance level to the fruit sugar fructose it's off my menu, more's the pity. Actually there might be something in this picture here. Everyone's hoeing away and there you are digging for the pips. Some people are definitely pip-diggers. I do remember my problem with seeds at the time and it was essentially that I couldn't figure how to spit them out properly. So if one got in my mouth, in went the fingers to get it!